Comprehensive review of Bliss A Tan For All Seasons. See what the experts and actual users have to say about this self tanning product. Bliss A Tan For All Seasons is a good, but not great self tanner. It smells terrific, is very light and dries extremely quickly. But the color produced is a little light and may require several applications. Overall, if you’re very light-skinned this product is a good choice. Unfortunately, it’s very expensive so repeated application to achieve a darker color isn’t really practical. 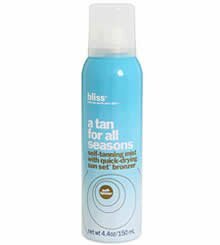 Bliss A Tan For All Seasons comes out as a fine brown-colored mist. The bottle actually works more as a spray versus a mist, which usually has a pump. Like all spray self tanners, Bliss is fairly easy to apply, but you’ve got to be careful as there is little room for error. We had trouble applying this product correctly on our feet and especially our back (if you’re applying this alone using a strap or wand). You’ve also got to put a towel down on the ground or the mist particles will settle on the floor and you’ll end up with product all over the bottom of your feet! Other than those areas, application wasn’t too bad. This product has a very slight tint to it so you can see where you’re applying it. One of the big benefits of spray self tanners is how quickly they dry. And in that regard Bliss A Tan For All Seasons excels. The solution dries extremely quickly (which also means you’ve got to move quickly as you apply this product). The upside to the quick drying time is this product really doesn’t get on your sheets or clothes. We’re big fans of that! We really liked the smell of this self tanner. It has a fresh, clean smell that we think pretty much everyone will enjoy. After Bliss A Tan For All Seasons dried, it continued smelling great. The next day it smelled like it did out of the bottle except much lighter. This is where Bliss A Tan For All Seasons could improve. Although the color wasn’t bad, it was pretty light for such an expensive, department-store product. If you’re extremely fair-skinned that might not be much of a problem. But for most, it’s going to take several applications before you see the color you want. That’s going to get really expensive with this product over time. The color we got from this product started to fade quite a bit after about 3 days. Technically it lasted 5-7 days, but because it’s so light to begin with, the fade is very pronounced. The nice smell and light tint makes this one men should be ok using. Bliss A Tan For All Seasons costs $36 for a 4.4 ounce bottle. That works out to a whopping $8.18 per ounce, which is very expensive by any standard. To buy Bliss A Tan For All Seasons, click here.